It's always been The Diner. The typical greasy spoon that never left the fifties. 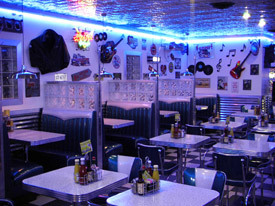 Plastic and vinyl light blue chairs and booth benches and white formica speckled tables compliment the black and white checkerboard floor and the fifties and sixties nostalgia that line the walls. There are vinyl records, a neon Coke sign, and a good old fashioned jukebox. Bar stools line the counter, and the specials are written in white block chalk and cursive letters on a black board that hangs behind the bar. Even the neon sign over the top of the building has that old style feel and look to it. Open twenty-four hours, and offering breakfast all twenty-four of them, The Diner is a popular drop spot for teenagers and adults. After a movie, you can enjoy shakes and fries; in the morning it's the pick me up coffee and doughnut. The staff isn't required to dress for the theme, but the majority do it by choice. July 7, 2012: Quintin invites Jenna out to a brunch of honesty.